Ski season is starting. Are you ready for skiing? How your body is ready for this, as some call it light recreational activity, but skiing is much more than that. Find out in this article the most important issues related to the preparation for skiing and evaluate your ability to avoid injuries which are increasingly common due to inadequate preparation. I have personally witnessed how unprepared the body for strenuous ski days, there are serious consequences for violations, and another failed winter ski vacation SHOULDER DISLOCATION AND RECOVERY-my story. Muscle fatigue, lack of stamina, concentration and other disadvantages are the main cause of crashes with serious consequences. Experiences and experts say the biggest enemy is muscle fatigue for skiing, and it is responsible for many ski injuries. The data shows that during the seven-day ski break, on Wednesday and Thursday, going on the greatest number of falls and accidents, especially in the afternoon! When you falls the most common injury is knee injury, as a result of crossing skis (anterior cruciate ligament injuries with almost 10-15% frequency), next one is dislocations of shoulder, injuries collarbone, hip injuries and others. Such injuries can permanently prevent you ski or may result in chronic pain and problems throughout life. There are basic principles and principles of training on how to prepare your body for the efforts that follow the ski vacation. Basic components of the preparation are: Cardiovascular Training, Functional Strength Training, Flexibility Training, Balance and Proprioception Exercise, Specific Ski and Plyometric Training. Preparation and training should start from 6 to 10 weeks before the holiday. Cardio training consists a minimum of 30 minutes of cardio exercise with a change of pace from 2 to 3 times a week: bike, running, rowing … If you can not endure the intensity for 30 minutes, insert a pause of 1 to 2 minutes between activities than 3 minutes. Functional strength training is strengthen the entire kinetic chain represents a functional simulation of movements in skiing. Individually perform exercises and movements (jumps, steps forward, kettlebell, ropes, a combination of push-ups, pull-ups and burpees) and later assembly into one unit will prepare your body for similar tasks that await you on the track. Flexibility training is compulsory and represents a very important static and dynamic stretching torso and legs in preparation for skiing. Your body will be more flexible and less susceptible to injury collisions and falls. Stretching after worm up and after functional training and strength training! Training of Proprioception and Balance. Dynamic equilibrium must control the balance in body movement while skiing. The basic ski movements and techniques involve transferring weight from one foot to the other, and a balance through exercise proprioception that provides better control of movement in the knee (T plates, plate with a semi-sphere, cylinders of different sizes, SLACKLINE – wide band stretched between two supports, INTO BOARD – slab roller, BOSU ball) is fixed for safe skiing. Specific ski and Plyometric Training simulates real ski movements, develops explosive power of legs and CORE muscle (strengthening the abdominal wall, rotator troops and lumbar). Through the basics of exercise squats and jumps with the load to the cables for more faithful simulation of a particular ski position. Very common sports injury that can result in a problem in the shoulder part throughout all your career. As I pulled my shoulder while skiing just a few months before going to work as a fitness instructor in Dubai, my full recovery and return to the gym, will be the topic of today’s text. In short we will go through the anatomy of the shoulder part, the concept and the types of dislocation of the shoulder joint. Shoulder hoop consists of 4 joints that connect 4 bones. Specifically shoulder joint bind the two bones: the humerus and scapula. Joint is securing firm tissue, known as ligaments. Shoulder joint is also secure by deltoid muscles and tendons. This joint is the most mobile joint in the human body and thus the most likely to cause most complicated injuries. Dislocation occurs after separation joint parts after some force. Depending on the direction of the shoulder dislocation, there are: front (among the 90% of all dislocations), rear and bottom dislocations. Due to the dislocation of degradation and stretching the ligaments that hold the joint, or in severe cases leads to the tearing of ligaments. 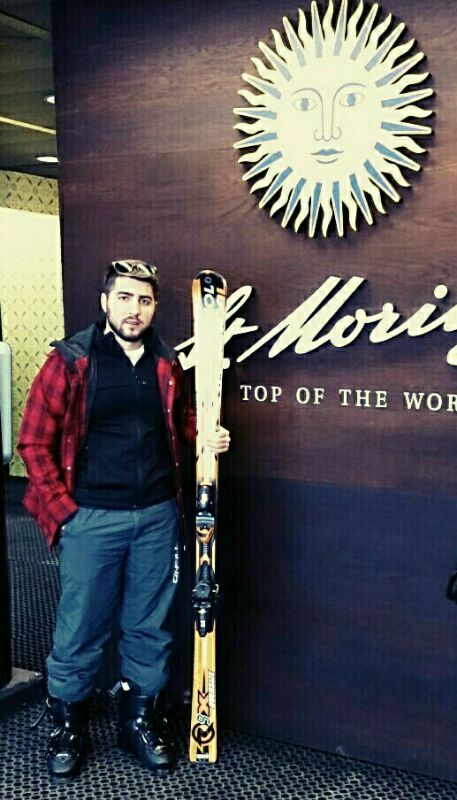 After signing the contract for the fitness company from Dubai and waiting to finish the paperwork and visas in order to make the journey, in the meantime, I decided to go in January, on Olympic mountain Jahorina for skiing. As a good and experienced skier, for me it’s supposed to be a relaxing holiday before working trip. Turns out it was not. 3 days of fog, cold weather did not stop me to open and close the wire on the track, what i always did. 4th day and a beautiful sunny morning promised it will be a beautiful skiing day. After a couple of slope in the morning at one moment I split off from the team and started alone to ski. A small error and high speed caused huge inertia, rolling and fall on head and right shoulder at one time. The vertical drop and strong shock caused the internal dislocation of the shoulder which was concluded by an Englishman, random skier who skied here and stopped to help me, he is a doctor by profession. Ski-do is came for me, and on the way to a small clinics I did not remember anything because of pain. Upon arrival the doctor and after removal equipment from me scene it was terrible, right shoulder almost did not exist, even hoped in a hand movement was impossible. Proposal is to send me in Sarajevo hospital, because the case was complicated. I told the doctor that the pain is not a problem I can tolerate that, just ask him to try to return the shoulder. With the great fear, which I felt at his behavior, he put me on the bed and almost with the principle of the lever at a mechanic’s, he move shoulder back into place. Satisfaction was mutual, he put me the triangle and bandage, and the next 4 days hotel was the only place I spent time where I had a lot of time to reading and analyze this form of injury. Recovery prognoses were that I would need six months to rehabilitate the injury, which i almost achieved in less than 3 months. Breaststroke Swimming without any medications, creams and treatments showed a large positive effect for the rehabilitation of the shoulder dislocation injuries. It is wonderful when the client comes to me in April and say, is great we have two months to lose weight and prepare body for summer. A fact is, his brought 20,000 extra calories in the winter and get 10 kilograms overweight, because it was cold period without activities, he was overtaken by holidays and celebration … well, it can all be caloric possible with an allowance if you start at the wright time, NOW, with training twice a week, maintain weight, keep the speed of your metabolism and calorie consumption, and we can see each oder on spring and for two months make your body so nice that all will turn on you at the beach. It’s all a matter of habit. My experience working in the world as a personal trainer shows that the lot of people have habit of exercise during all year. They do not kill themselves with training two months before summer, they continuously used body on effort, which was mild, for example, compared to a few months of intense exercise 4 times a week to make six pack for the beach. Sudden changes from passive over the winter to a very active state of the organism before the summer cause serious injuries, tendinitis, sprains and tearing ligaments and overtraining. Fast walk, run, hiking, biking when the weather allows it. When is cold, fitness center and lightweight functional and circuit training for 45 minutes, that activities should begin now. Who likes to ski, the season starts in a few months and then make sure that you do not put on weight because of the knee suffering, a pain in muscles and legs due to overweight are inevitable. Constant maintenance of your fitness level by just 2 sessions per week throughout the year, you will not need high intensive training before summer. In the spring, just insert a third training during the week and your body will be ready and taut. Metabolism will not slow down during the winter, stay active, you entered using the calories that will not settle in fat, you will be more mobile, less apathetic and depressed because of the cold and bad weather. The point of a healthy and quality lifestyle and diet is not a waiver, is only moderate consumption of food and frequent physical activity! St. Moritz je odmaralište u dolini Engadine u Švajcarskoj. To je opština u okrugu Maloja u Švajcarskom kantonu Graubunden. Najviši vrh u istočnim Alpima, Piz Bernina, leži južno od grada nekoliko kilometara. Moritz je bio domaćin zimskih olimpijskih igara 1928. i 1948. godine. To je popularna destinacija za visoke klase i međunarodni dzet set, kao i jedan od najskupljih skijališta na svetu. Takođe je bio domaćin 1934. 1974. i 2003. za skijaški svetski kup, i predstojeći 2017. St. Moritz is a resort in the Engadine valley in Switzerland. It is a municipality in the district of Maloja in the Swiss canton of Graubunden. The highest peak in the eastern Alps, the Piz Bernina, lies south of the city a few kilometers. Moritz hosted the Winter Olympics in 1928. and 1948. It is a popular destination for high class and international jet set, as well as one of the most expensive ski slopes in the world. He also hosted at 1934. 1974. and 2003. the ski world cup, and the upcoming 2017. To je jedan od tri grada koji su bili domaćini zimskih olimpijskih igara dva puta, ostali su Innsbruck – Austrija i Lake Placid – New York u Sjedinjenim Američkim Državama. Pored toga on je bio domaćin FIBT Svetskom prvenstvu (Bob i skeleton Racing) . St. Mortz je izuzetno popularan u letnjim mesecima kao centar za visinske pripreme profesionalnih sportista, posebno biciklista i trkača. Njegova popularnost zasniva se na nadmorskoj visini, na dobrom vremenu (oko 300 sunčanih dana godišnje) , posedovanju atletske staze , jezeru, koje zimi kada se zamrzne služi kao staza za nordisko skijanje i polo sport. Pored navedenih sportova, St. Moritz je poznat i kao destinacija za jedrenje leti. It is one of three cities that have hosted the Winter Olympics twice, remained Innsbruck – Austria and Lake Placid – New York in the United States. In addition he hosted the FIBT World Championships (Bob and Skeleton Racing). St. Mortz is extremely popular in the summer months as a center for altitude training professional athletes, especially cyclists and runners. Its popularity is based on the altitude, the good weather (about 300 sunny days per year), possession of an athletic track, that winter when the lake is frozen serve as a trail for Nordic skiing and polo sport. In addition to these sports, St. Moritz is also known as a destination for sailing and flying. Ovaj region poseduje 350 km skijaških staza. Gornji Engadin je zaista poseban sa obiljem sunca. Zahvaljujući nadmorskoj visini od 1.800 do 3.303 metara iznad nivoa mora, sneg je zagarantovan. I šta više , ovde se nalaze moderne žičare koje obezbeđuju minimalno vreme čekanja. Ovde je zimski turizam rođen pre skoro 150 godina. Planinski lanci, freeride padine, snežni parkovi za extremne sportove, prostrane staze predstavljaju velike izazove za ljubitelje zimskih sportova. Na jednom delu planine nalazi se i specijalno pripremljena veleslalom Audi Word Cup staza sa kapijama, radarom za brzinu i satovima za merenje vremena, koju mogu da koriste i rekreativni skijaši kao adrenalinski izazov. Centri Corviglia, Corvatsch i Diavolezza su sinonim i izazivaju strahopoštovanje i za iskusne skijaše. Može se naći skoro sve u švajcarskom najvećem SNOW SPORT regionu, od poznatih područija sa širokim spektrom ponuda do manjih mirnijih porodicnih seoskih krajeva. Ne zaboravljajući brojne panorama restorane, ski kolibe i snow barove, sve pršti od ambijenta žive planinske zabave. The region has 350 km of ski trails. Upper Engadine is truly special with plenty of sun. Thanks to an altitude of 1,800 to 3,303 meters above sea level, snow is guaranteed. And what’s more, here are highly modern lifts which provide a minimum waiting time. Here is winter tourism was born almost 150 years ago. Mountain ranges, freeride slopes, snow park for extreme sports, spacious paths of the great challenges for winter sports enthusiasts. On one part of the mountain, there is a specially prepared giant Audi Word Cup trail with gates and clocks for measuring time, which can be used by ordinary skiers as adrenaline challenge. Centers Corviglia, Corvatsch and Diavolezza awe-inspiring also for experienced skiers. One can find almost everything in the biggest Swiss SNOW SPORT region of the known areas with a wide range of offers to smaller rural family ski lift. Not forgetting the numerous panorama restaurants, ski huts and snow bars, all the fingers of the living environment of mountain fun. Uređenost staza, ski žičare, ski mape, kultura na ski stazama ostavljaju jak i pozitivan utisak na svakog skijaša. Zato se sa razlogom može reći da je ovo jedan od najboljih ski centara na svetu ako ne i najbolji. Kao iskusnom skijašu i instruktoru veoma impresivno mi je bilo videti sve te odlicno tehnički obučene skijaše od 7 do 77 godina, što se može i očekivati od švajcarske nacije koja je sa razlogom jedna od najtrofejnijih na svetu, kada se govori o zimskim sportovima. Tidiness trails, ski lifts, ski maps, culture on the ski slopes are really left a strong and positive impression on me. So can reasonably be said that this is one of the best ski resorts in the world maybe the best. As an experienced skier and instructor very impressive to me was to see all these great technically trained skiers from 7 to 77 years, as can be expected from the nation of Switzerland, which is also a reason one of the most successful nations in the world as for winter sports.